Welcome back to the Social Justice Book Club: Borders, where we will read and discuss fiction, nonfiction, and poetry about immigration, asylum, and borders. Join us on the last Sunday of every month for insightful conversation. 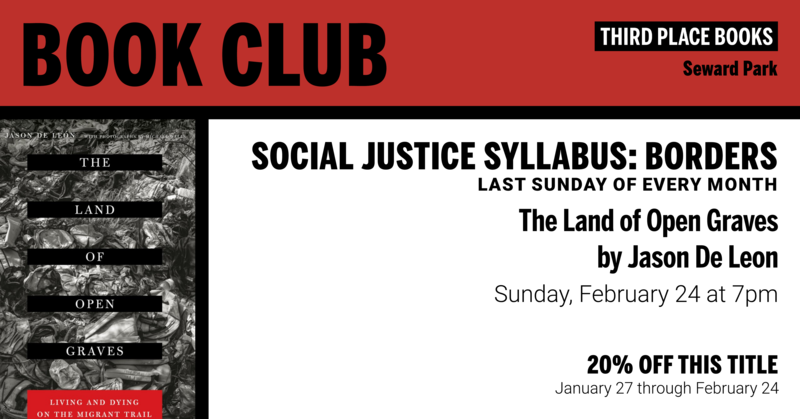 This meeting of Social Justice Syllabus: Borders will discuss The Land of Open Graves on Sunday, February 24 at 7pm. Every month our selected titles are discounted 20% through the date of the book club. All are welcome, no purchase required. For our second series, Borders, we will read fiction, nonfiction, and poetry about immigration, asylum, and borders. Join us on the last Sunday of every month for insightful conversation. This month we’re reading and discussing The Land of Open Graves by Jason De León, with photographs by Michael Wells. The book, a collection of photographs and stories illuminating De León’s work with the Undocumented Migration Project, was awarded the Margaret Mead Award by the Society for Applied Anthropology for its effectiveness in sharing anthropological information with the broader public. De León and his colleagues at the Undocumented Migration Project have, since 2009, collected, photographed, and catalogued the materials left behind at this remote section of the border, “in the strip of desert just south of Tucson.” (For those who read our previous book, Borderlands/La Frontera by Gloria Anzaldua, this area sits approximately 1200 miles northwest of Harlingen, TX, where Anzaldua was born.) The UMP is an ongoing and interdisciplinary project involving researchers who want to understand and illuminate the ways in which official U.S. border policy encourages and perpetrates violence on small and large scales. About a year ago, Radiolab produced a trilogy about De León’s work at the border. You can listen to that here. “I’ve learned over the years that as an ethnographer, I have little control over the settings where important fieldwork moments happen. If I did somehow have a say in these matters, I would choose to be anywhere except a Dunkin’ Donuts in Queens, New York. Christian and I are sitting by the window sipping coffee as Saturday traffic passes by outside. I thought this place would be quieter than the restaurant we just ate lunch in. Instead of being drowned out by linking plates and salsa music, we are now awash in orange and fluorescent pink, the corporate colors of this donut chain, and teenage pop music screaming out of the ceiling speakers. This hardly feels like an appropriate place to reveal the dead. ‘Did you really bring photos of her body?’ Christian asks me for the third time. Reluctantly I reach into my bag and pull out a small envelope that bears the logo of the pharmacy where I had the pictures printed. I didn’t want her to be an email attachment, so I had to stand at a Kodak Film kiosk for twenty minutes while five-by-seven glossies of her bloated body shot out of the machine. None of this seems appropriate. I hand him the first picture, which shows the back of her head and her right hand. He looks at in silence for almost a minute." Dr. Jason De León is an associate professor of Anthropology at the University of Michigan. His Instagram says he’s moving to UCLA this summer. In addition to being named a MacArthur Fellow in 2017 for his anthropological work, De León was particularly well-qualified to teach the Anthropology of Rock and Roll course at the University of Washington after having been a working musician for many years; it seems fitting to end things with a grainy video of him playing with his band, The Wilcox Hotel, from back when they were touring with Dashboard Jesus.